We’ve all done it. Loaded the fridge with brightly coloured produce, bought a loaf of freshly baked bread, only to have our plans to make that pot of homemade soup foiled after being asked to work overtime. By the end of the week, soup has not been made and unfortunately the fridge is now full of half-rotten food. A recent study out of the Western University’s Ivey Business School in London Ontario has found that the average Canadian wastes about 20% of purchased food, costing individuals just over $1,500 a year, not to mention the environmental impacts created by food waste such as greenhouse gases, carbon dioxide and methane. The report concludes that a key factor contributing to food waste is that food is cheap, with the real cost of food dropping from 19 percent of total household expenditures in 1961 to 9 percent in 2007. What the news article failed to point out from the original report is that a staggering 50% of the food wasted in the home is a result of fruit and vegetable spoilage. 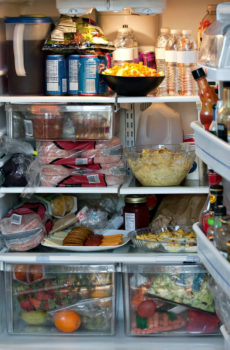 To reduce spoilage, the report suggests shopping more frequently and purchasing smaller amounts of food. It’s great advice particularly if you walk to the store to get your groceries; however, driving more often won’t do the environment any favours. Another way to reduce food waste is to purchase frozen fruits and vegetables. Companies use flash freezing techniques to help lock in nutrients and extend the shelf life of frozen food. Unlike fresh produce that is often harvested and ripens on its way to market, frozen produce is picked when fully ripe and full of flavour. To solve the problem of a last minute change of plans, throw your not-so-fresh-looking produce into a freezer bag and toss it into your freezer. You can always use your frozen fruit to add to a breakfast smoothie and your frozen vegetables for that delicious pot of soup you were going to make. If you are looking for ideas on what to do with all that frozen food – check our team’s healthy meal plans.